The camp site is located separately from the hotel. The natural, somewhat slanting terrain with magnificent, old oaks is surrounded by ramparts. The open field in the centre turns into a beautiful flower tapestry in springtime. Children have ample opportunity to enjoy themselves at the camp site without disturbing the other guests. 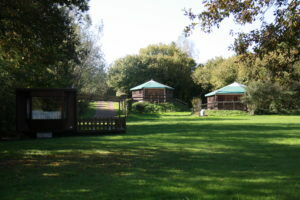 The camp site provides 10 camping pitches, 6 for tents or caravans, and 4 for renting a camping bungalow, red cedar caravan or an adventurer’s tent. All pitches are large (120 m2). Five pitches are located side-by-side next to the rampart, and the 6th pitch is near a great oak. The terrain is not suited for heavy mobile homes or caravans. A water tap and electricity are present at the camp site. The sanitary facilities, shower, toilet, and washbasin with hot and cold water are situated in the extension (former barn). A washing machine and drier are available. In the high season, the baker will visit the camp site on a daily basis. If you don’t want to drag along your own camping gear, we can offer you various rental options. You can choose a 2-4 or 4-6 persons bungalow. The 2-4 persons bungalow (24 m2) is a pleasant, six-squared wooden bungalow with many windows, opening doors and a roof that is partly covered with light-permeable oilcloth. 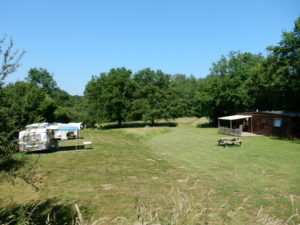 The terrace overlooks the camp site. The bungalow is furnished for 4 persons. Included are beds and pillows, a table and chairs for inside and outside, an open kitchen with a refrigerator and cold water tap, a cooking stove with three gas burners, kitchen utensils, a Mepal dinner set, and a coffee machine. There is one bedroom with 2 single beds (bunk bed, 0.90 x 2.0m). The double bed (1.40 x 2.0 m) in the living room is a sleeping couch. The 4-6 persons bungalow (32 m2) is similarly equipped as the 4 persons bungalow, but with an additional bedroom with a double bed (1.40 x 2.00 m). 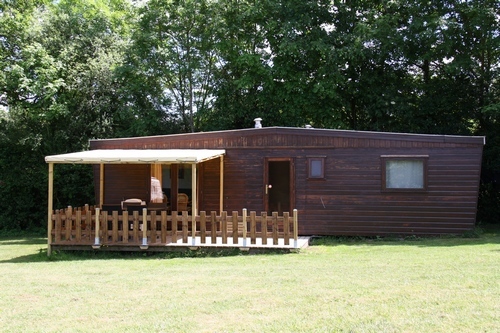 Camping bungalow guests use the sanitary facilities of the camp site. Bedclothes and towels are not included. 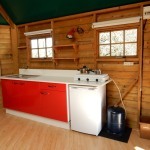 The red cedar wooden caravan can lodge 4 persons and has many windows and opening doors. The caravan is fully equipped and furnished for 6 persons. The spacious living room has an open kitchen with hot and cold water. There are 2 bedrooms, one with a double bed (1.40 x 1.90 m), and the other with 2 single beds (bunk bed, 0.80 x 1.90 m). In the living room, there is a sleeping couch for 2 persons. Private sanitary facilities are present. Towels and bedclothes are not included. 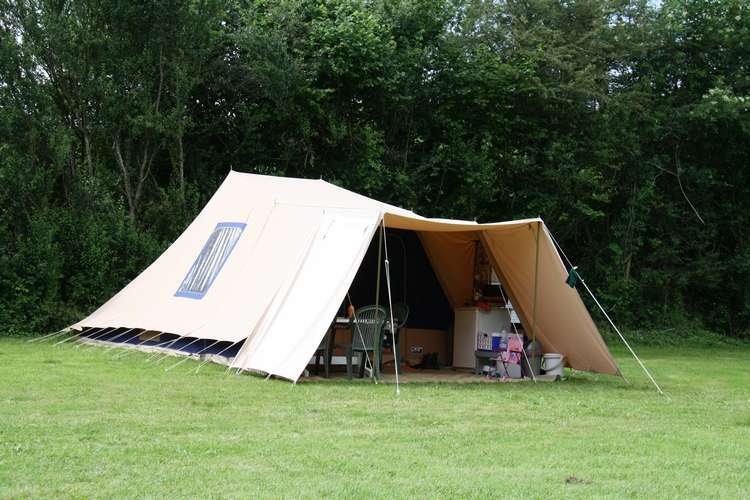 The adventurer’s tent (type ‘Eagle’) can lodge 4 persons and is fully equipped for 4 persons. The tent has a large tarp, 3 sleeping cabins, and a completely equipped kitchen with a refrigerator. Outside furniture is present. Bedclothes and towels are not included. For guests of the camp site we can serve a French-style, 3-course dinner (‘menu Gastronomique’) if notified before 10.00 a.m. We will regularly organise a barbecue at the terrace. In that case, the ‘menu Gastronomique’ is cancelled. You can also sign up for breakfast or lunch. Our guests can take cool refreshments from the restaurant’s refrigerator, to be paid at a later moment. Feel free to try one of the specially selected wines that we bought at one of the local small wine farms. The library is situated in the barn (extension) and is open 24 hours a day for all guests of Sur Yonne. Here you will find many books, comics, games and toys for (young) children. You can also find information about the area, hiking tracks, and bicycle and motorcycle tours. Pets are allowed at Sur Yonne, but only when leashed and not causing a nuisance.